As the cruise industry continues to boom, so too does Bureau Veritas’ (BV) marine division, which has a long history and promising future in the sector. 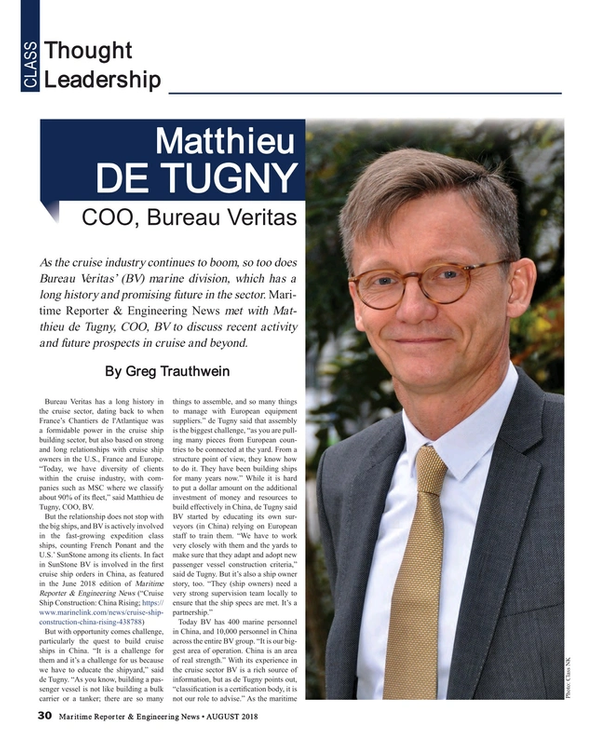 Maritime Reporter & Engineering News met with Matthieu de Tugny, COO, BV to discuss recent activity and future prospects in cruise and beyond. Bureau Veritas has a long history in the cruise sector, dating back to when France’s Chantiers de l'Atlantique was a formidable power in the cruise ship building sector, but also based on strong and long relationships with cruise ship owners in the U.S., France and Europe. “Today, we have diversity of clients within the cruise industry, with companies such as MSC where we classify about 90% of its fleet,” said Matthieu de Tugny, COO, BV. Looking at the issue of fueling ships, with the IMO Sulfur rules coming in 2020 and the recent mandate to cut emissions by 50% by 2050, de Tugny thinks that the debate over meeting the new regulations is the biggest topic du jour, and will be for some time to come. But whether the choice is LNG or another alternative fuel, scrubbers or some other option, it all comes down to money and the financial impact on the shipping companies. Late last year when French shipping giant CMA CGM ordered a series of 22,000 TEU containerships with an LNG fuel option, de Tugny said “I think that was a milestone in the shipping industry …” the company took the risk and now “the train is leaving the station” on LNG as fuel in maritime.